The new tarantula’s extraordinary morphology has also prompted its species name: C. attonitifer, which is derived from the Latin root attonit– (“astonishment” or “fascination”), and the suffix –fer (“bearer of” or “carrier”). It refers to the astonishment of the authors upon the discovery of the remarkable species. Individual of the newly described species in defensive posture in its natural habitat. Photo by Kostadine Luchansky. 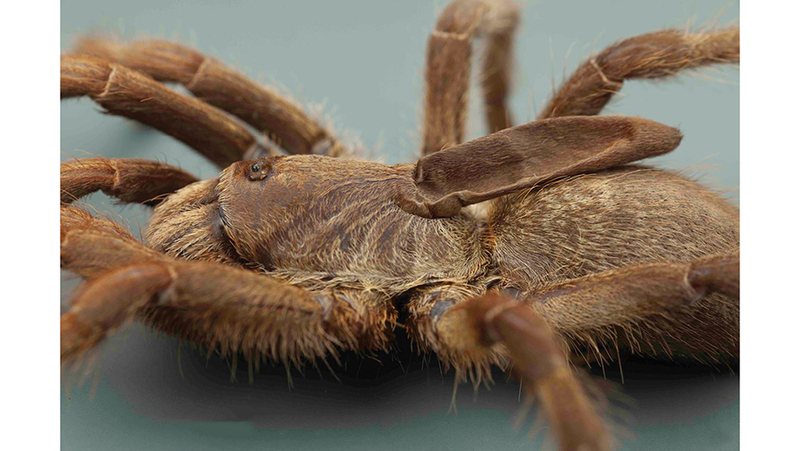 The newly described baboon spider species (Ceratogyrus attonitifer), showing the peculiar soft and elongated horn-like protuberance sticking out of its back. Photo by Dr Ian Enelbrecht.